Of course, as we pointed out previously, LINK, state and federal environmental laws have effectively eliminated the mail-back programs of CFL manufacturers. Researchers found the only legally acceptable shipping container is “a double box with a zip closure foil-plastic laminate bag between the cardboard layers" if CFLs are to be shipped by U.S. Postal Service or common carrier. To ignore this requirement would subject violators to the penalties of the law, which would surely exceed the value of a replacement bulb. The cost of the acceptable container and the postage/shipping charge must also be paid by the consumer returning the product. The result is that probably nobody is ever going to return a broken CFL to Armorlite. It's not worth it. And I would wager that many disappointed customers will not consider it worth their time and gas to deliver a failed bulb to a recycling collection point either. Even if the government inspected everyone's trash—think of the cost of that!— to prevent people from “smuggling” CFLs into their discards, I suspect we would see an increase of CFLs in other people's trash or strewn along roads. The new Armorlite product has not solved other CFL problems either. Its package states: “Do not use in luminaries controlled by a dimmer, electronic timers, 3-way socket or photocells, illuminated switches, totally enclosed luminaries, or where directly exposed to weather. Do not use with emergency fixtures or emergency lights. This CFL may interfere with other products like radios, cordless phones and others.” Incandescents have none of these problems. “Those light-emitting diodes marketed as safe, environmentally preferable alternatives to traditional lightbulbs actually contain lead, arsenic and a dozen other potentially hazardous substances, according to newly published research. Statists believe government can determine people's economic interactions better than the people themselves. In short, they believe government economic planning is superior to the free market. Politicians are always looking for ways to demonstrate this to justify the statist ideological conviction and retain the political power to force it on the public. From low-flow toilets to ethanol subsidies and mandates, to creating the housing bubble that collapsed (taking the rest of the economy with it), and everything in between, they have a consistent record of failure. Now it's CFLs. People are being forced to switch from a reliable, economical, environmentally safe product to one which is none of these—and a health and safety hazard to boot. The politicians who passed the law phasing out incandescents wanted a trophy they could hold up to the voting public and say, “See, we gave you something better than what a free market could give you. We advanced society.” Instead of a trophy of success, they have a monument to the failure of their ideology and their ignorance of economics. Politics is no substitute for economics. It can only produce an uneconomic result: if the result were economic, it wouldn't require government coercion. I write these articles and my books to demonstrate this. The Big Government advocates are as ignorant of history as they are of economics. 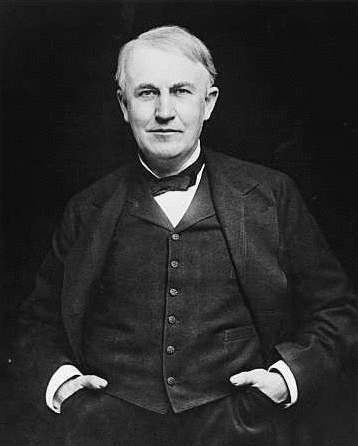 How did Edison's carbon-filament bulb lead to the worldwide popularity of incandescent lights for well over a century? Was it because government shoveled subsidies of taxpayer money to Edison to develop it and make it economic? Or because government passed laws requiring people to buy those bulbs? No, Edison developed the bulb on his own, and it had to prove itself to consumers. It had to be better for them—in their judgment, not that of politicians—than the competition from kerosene lamps or Welsbach gas burners. Now we are being forced to buy CFLs—judged inferior by many people, whose choices are overridden by the “superior” wisdom of arrogant, ignorant politicians—and costing far more than incandescents. We're going in the wrong direction, led by people who don't know what they are doing, who have no understanding of the nature of human progress—that it results from the exercise of individual rights, not government obliteration of them. Free markets allow for the exercise of those rights. CFLs are a metaphor for America gone wrong. "Are you all really that stupid?" Outstanding follow-up on your original article. Is that a photo of you? You look a lot different. Just kidding. One thing I'd like to see about CFLs is a relative risk analysis such as you've presented for second-hand smoke. I suspect that the EPA has lowered acceptable levels of Hg and Pb for example to way below what science can prove is a danger to us. Then with respect to CFLs the EPA is winking it's all-knowing all-wise eyes in acceptance to mfgrs and consumers of Hg level in CFLs. I've been reading a lot of issues about CFLs and the danger it may bring. I don't know if I already need to change my bulbs at home. All of my bulbs are CFLs. My contractor who took his Contractor CE said that LED is much better to use. LED bulbs do not have the danger of exploding or starting fires, as has been documented with CFLs. But as I pointed out in the blog, "recent LED research at the University of California at Irvine found the lead content was over 8 times the regulatory limit, and the nickel content was over two and one-half times. Under California's environmental law, most LEDs would qualify as hazardous waste." I suggest you re-read that part and click on the "link" to the university study pertaining to this. Incandescent bulbs do not present the environmental danger of improper disposal that occurs with LEDs or CFLs. Myself, I will NEVER use a CFL, even if they were free--or even if I was paid to use them. I have enough incandescent to last at least 25 year, and I don't expect to live longer than that. I purchased these for a total cost of $30. Many good bargains are available as stores are selling them at a discount. For example, I purchased a ten-pack of 2,000 hour 100-watt bulbs for ten cents apiece. The $30 I spent on these bulbs wouldn't pay for replacing even one of the fine lighting fixtures I would have to discard if I had to buy new fixtures to use CFLs. Plus I like my fixtures and don't want to replace them.